The Southwest Regional Manufacturers Association (SRMA) is pleased to announce its premiere inaugural event, Made in SWFL, taking place 9 a.m. to 6 p.m., April 16 at Harborside Event Center in downtown Fort Myers. STEM students from all schools are invited to attend a special interactive presentation from 9:30-noon with a reservation. From noon until 5 p.m., the public is invited to attend the Made in Southwest Florida Showcase. Admission is free with a business card, $5 without. Exhibitor booths and sponsorships are still available, but selling quickly. 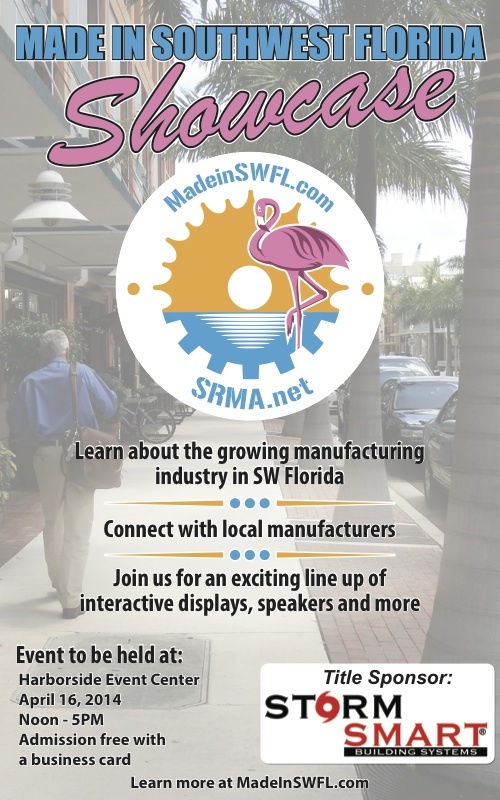 If you are a manufacturer, employee, STEM student or job seeker, the SRMA Made In SWFL show is your best opportunity to connect and network with local manufacturers. A packed schedule of dynamic presentations from local manufacturing leaders, a trade show open to the public and the presentation of the 2013 Manufacturer of the Year awards makes this an event that should not be missed. Manufacturing has solidly established itself as a driving force in the local economy, and the Made in SWFL show shines a much deserved spotlight on this “unsung hero” sector, which is enhancing diversity and opportunity in the region. Manufacturers in Southwest Florida enjoy a thriving business environment that includes tax advantages for relocation and a wealth of sales and use exemptions for electricity, machinery and equipment. Highlights of the day-long program include a presentation by Brian Rist of Smart Industries, the event’s Title Sponsor, “How and Why to Find a Job in Manufacturing.” Peter Bagwell of Polygon Solutions will speak on “Innovation, Technology and Upward Mobility.” Neil Bourgeois of The SolidExperts will offer a compelling talk on “3D Printing Rapid Prototyping.” The busy educational agenda also includes workshops on tax topics such as foreign sales; R&D tax credits; tax savings for capital investment, purchases and renovations; and consulting and investing advice for closely held businesses and their owners. An educational section on grants will also be offered. The day will wrap up with an awards banquet evening to recognize the 2013 Manufacturer of the Year and Manufacturing Employee of the Year. After being photographed on the red carpet, finalists and attendees will participate in an elegant reception followed by a gourmet dining experience and awards presentation. Local dignitaries and business leaders will be in attendance. For more information visit madeinswfl.com. To purchase tickets for the awards dinner, become a sponsor or reserve an exhibitor’s booth, contact Axol Ojeda 239-628-5850, axol@srma.net. or Dan Allen at dan@srma.net or 239-898-1623. The purpose & objective of the Southwest Regional Manufacturers Association is to bring together manufacturers to encourage the economic development of Southwest Florida through manufacturing, and to act as a forum for the expression and exchange of ideas and information among its members. The SRMA provides the platform to promote the general welfare of our members in relation to economic, civic, and educational challenges. We encourage the cooperative interchange of information and assistance in all matters of mutual interest, fostering social relationships and community involvement among our membership. Learn more at www.srma.net.